The question alludes to U.S. President Barack Obama’s reference to the ‘red line’ having been crossed in Syria, in the wake of alleged use of chemical weapons, and threatening military action, which has been averted by Russia jumping in to build a bridge to President Bashar Hafez al-Assad. “The horrors of the attack in Syria have shown the danger inherent in the continued possession of weapons of mass destruction. The global outrage in response to the carnage caused by the use of chemical weapons is proof that until they are eradicated, there is a significant risk that one day they will be used, whether by intention or by accident. Nuclear weapons, for all their status and symbolism, are not exempt from this stark reality, and the cost of neglecting to recognize this would be disastrous,” the ICAN warns. Eight ‘confirmed signatories’ of the statement, besides Liv Tørres, General Secretary of the Norwegian People's Aid, who posted it on The Huffington Post, are: Madeleine Rees, Secretary General, Women's International League for Peace and Freedom (WILPF); Philip Jennings, General Secretary, UNI Global Union; Jan Gruiters, Executive Director, IKV Pax Christi; Kate Hudson, General Secretary, Campaign for Nuclear Disarmament (CND); Akira Kawasaki, Member of the Executive Committee, Peace Boat; Michael Christ, Executive Director, International Physicians for the Prevention of Nuclear War (IPPNW); and Hirotsugu Terasaki, Executive Director, Soka Gakkai International (SGI). SGI – a lay Buddhist movement linking more than 12 million people around the world – has a pride of place among faith-based organisations. It has been campaigning relentlessly for abolition of nuclear weapons since the second Soka Gakkai President Josei Toda's Declaration Calling for the Abolition of Nuclear Weapons issued on September 8, 1957. In 2007, SGI launched the People's Decade for Nuclear Abolition campaign in order to galvanize public opinion in favour of banning all nuclear arsenal. In Peace Proposal 2013, Ikeda went a step further and pleaded for an expanded summit for a nuclear-weapon-free world: "The G8 Summit in 2015, the seventieth anniversary of the atomic bombings of Hiroshima and Nagasaki, would be an appropriate opportunity for such a summit, which should include the additional participation of representatives of the United Nations and non-G8 states in possession of nuclear weapons, as well as members of the five existing NWFZs (nuclear weapons free zones) and those states which have taken a lead in calling for nuclear abolition.". The signatories argue that nukes are indiscriminate weapons, whose effects cannot be limited or controlled. In fact, the use of even a small fraction of existing arsenals – more than 17,000 warheads – would disrupt the climate and threaten agricultural production, leading to the starvation of up to two billion people. This is because, as was made clear by the Hiroshima Committee of Experts in their analysis of the U.S. bombing of Hiroshima, "It is not possible to protect civilians from a nuclear weapons attack. To protect civilians, there is no measure other than to prevent a nuclear weapons attack from occurring, whether it be deliberate or accidental. To prevent the use of nuclear weapons, there is no way other than to abolish nuclear weapons themselves." 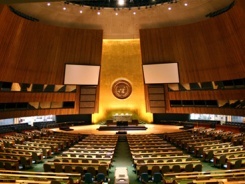 The Conference on the Humanitarian Impact of Nuclear Weapons in Oslo held in March 2013, concluded that it would not be possible to coordinate and deliver any meaningful humanitarian response, to a catastrophe brought about by nuclear weapons. No international organization or state could adequately deal with the situation. Experts pointed out at the Oslo conference that any use of nuclear weapons would eradicate hospitals, food, water and medical supplies, transportation and communications—infrastructure required for the treatment of survivors. They cautioned that physicians and paramedics arriving from outside would have to work without resources needed for effective treatment; furthermore, radiation, as we know from both Chernobyl and Fukushima, can make it impossible for rescuers to enter highly contaminated areas. “The current framework provided for multilateral nuclear disarmament negotiations has not been able to overcome the lack of political will of nuclear-armed states to comply with their obligations to disarm. Let us not allow deadlocks in meetings to be the legacy we leave behind us, for our children,” she added.